Some pictures are hard to put into words. 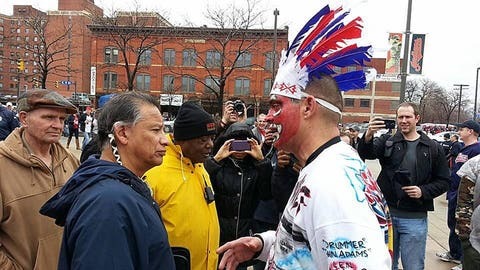 Like this picture, tweeted by @ClevelandFrowns, of a Cleveland Indians fan decked out in full Chief Wahoo gear (feather headdress and redface and all), encountering an actual Native American. To call this awkward is an understatement. This occurred Friday before Cleveland’s home opener against the Minnesota Twins at Progressive Field, where demonstrators gathered in their annual opening-day protest of the Indians’ continued use of the controversial Chief Wahoo logo. "We are not mascots. I’m nobody’s mascot. My children are not mascots," said American Indian Education Center executive director Robert Roche. "It mocks us as a race of people. It mocks our religion."